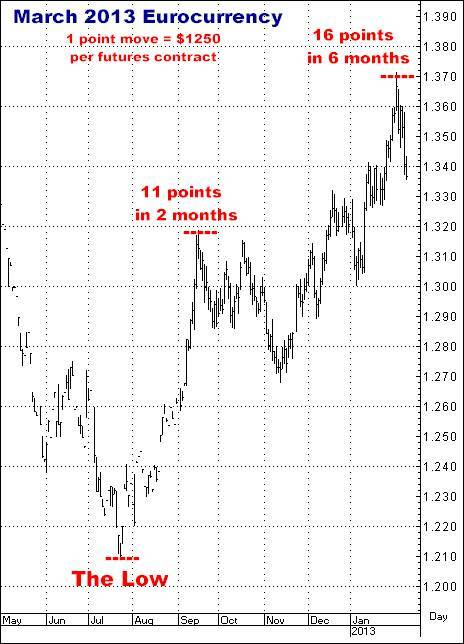 There is CERTAINLY an absence of “Irrational Exuberance”. I think the odds of a dynamic upside move in Stocks are EXTREMELY high. And I think it could be starting straight out of the gate in January. For the 1000th time, investing is more about mob psychology than anything else. Whether it’s a stock, or currency, or bond, or commodity future, all of these instruments are only pieces of paper that have perceived values as determined by the trading masses. No value is permanent and no value is real. Prices are more a function of fear, greed, and funds sloshing around than anything else…As just one example, we should understand there is no formula that ANYONE can point to that specifically can dictate or predict what the value of particular company’s stock is, or should be. Otherwise, you would have to think that stocks would only change their prices maybe once a quarter when earnings were reported, and then sit there again for 3 months, which is obviously not the case. Stocks are changing “value” every day, in reality, when you get down to it, on a minute by minute basis…From another standpoint, how many times do you have to see all the talking heads bleating about the PE of a company being too high to buy, at 20…and then see the same company’s stock keep zooming higher, perhaps resulting in that PE hitting 100…to not understand that the whole thing IS just a game? Really. If this is not just the world’s biggest video game, how CAN a stock trade at 7 times earnings… OR 150? I am firmly of the opinion that all those painted faces on TV and the internet are just well dressed, well spoken, but ultimately wrong sheep who help perpetuate the myths pertaining to the importance of PE’s, book values, market breadth, the VIX, Dow theory, Elliot Wave, Cycles, Death Crosses, 100 day moving averages, technicals, fundamentals, Fed policy, etc…and a 100 other supposedly predictive buzzwords that fall in and out of favor. For sure, there are times when any of those factors can be regressively pointed to as having provided clues as to what was about to happen, but my experience is that ALL of those “indicators” are only RANDOMLY correct…and furthermore, that they are especially meaningless ANY time you can find even 2 people out of 3 on an internet market panel mutually saying something like, “The so and so is flashing caution signals.” The whole thing IS a game and I firmly believe that 99% (literally) of the yakheads are nothing more than color commentators…who DON’T even come close to knowing what any of the markets are ever going to do. And…as can also be seen on the chart above, the stock market IS essentially dead on its highs…looking quite bullish I think…BUT…I detect virtually zero enthusiasm for an upside move as we head into 2016…To the contrary, as can be seen in the following collection of headlines from the past month, there is NO shortage of “experts” now calling for a top in the stock market. To be sure, there ARE some people who are bullish, but as evidenced above, on balance, there is a WORLD of analytical doubt out there...From my IMPARTIAL listening post, I find almost no one who is screaming, “Buy it!”…Even the brokerage houses, who are virtually ALWAYS bullish (their lifeblood is a rising market), and also are generally FAR more wrong than they are ever right, are only calling for 5% gains in the coming year, which, with today’s markets being able to move 5% in a matter of days, is like them saying, “We generally have no upside expectations this year”. The bottom line is, when I combine this lack of “exuberance” by the “professionals” with the fact that interest rates are at rock bottom (and NOT going to even remotely soon be rising to any level that might be considered restrictive)…and with energy prices now absolutely dirt cheap, meaning consumers worldwide are no longer pouring money into energy industry bank accounts, and are now free to spend that money however they may want to (in other words, CONSUME)…and with the Technology Revolution, I believe, now gearing up even MORE…and finally, with the continuing global explosion of Capitalism (cited here for several decades), the conclusion I come to is: JUST GET ON. BUY THE STOCK MARKET. PUT YOUR STOPS IN. SEE WHAT HAPPENS. There is no upside percentage gain that would surprise me. Think about it...The markets and the economy have been climbing since Spring, 2009, and I swear, the pundits have been spouting the same ludicrous negative theme for the entirety of those almost 7 years: “Growth just isn’t good enough”. And they are STILL saying it. True…or not? What do you hear? And here is the reality of those last 7 years…In spite of any number of media hyped crises since 2009, and talk about “the wrong jobs”, Or “the Fed should have this or that”, or a “European collapse”, or a “China Bubble”, or Terrorism, or WHATEVER…GDP has just continued to chug higher…AND I BELIEVE IS GOING TO CONTINUE DOING SO…AND MOST LIKELY, AT AN EVEN STRONGER PACE. Look. If you want to believe all the nonsense about “growth not being strong enough”, or that “the economy isn’t creating the right kind of jobs”, of any of the other negative economic malarkey that is being spouted out there, go ahead…But I say you will be succumbing to a major case of “can’t see the forest for the trees”. Really, WHERE is the weakness? Where is the danger? 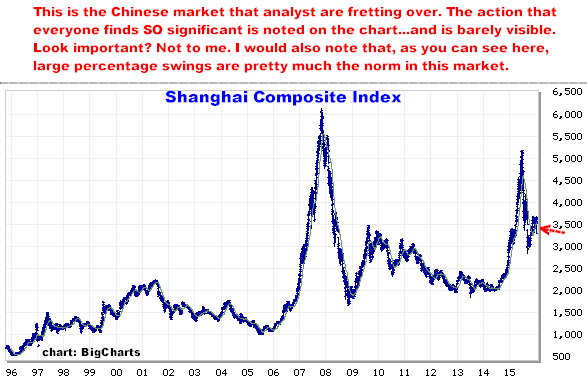 For sure, I know that the markets and the economy can hit the brakes at any time, but I believe those turns come when there is rampant, “irrational” optimism, severe overleveraging and hoards of analysts unanimously howling, “BUY the market NOW!”…and from where I sit, that just simply is NOT the case at present. 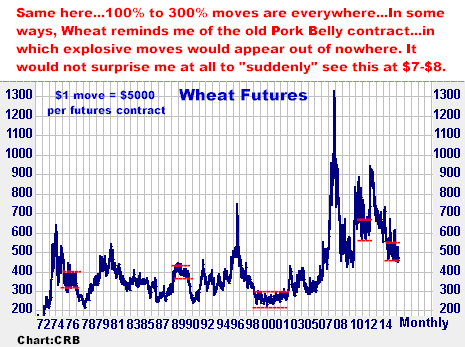 My point is, you don’t WAIT for all the sheep herd analysts to study all the data 6 months from now, AFTER the market has moved 20%, and start telling you, “Get in now!”. I say you buy the stock market & stock indices right here…right out of the gate in 2016…And this is just a guess on my part, but one scenario I can imagine is a BIG Stock Market surge in January, like on a magnitude of maybe up 15-20% (for real)...while all the pro’s just sit there and watch it run away…or while they are “waiting to see more confirmation”, or “urging caution due to rising interest rates”…or a blabbing about a host of other “reasons” they’ll have to stay on the sidelines…Then in early February, they’ll all cite the positive January indicator as have now signaled an up year for 2016, and how they’ve therefore “REVISED their forecasts” and THEN advise you to start buying…If my script is semi-accurate, and plays true to form, the next thing we’d probably see would be the market going nowhere to slightly lower for many months until they all get negative AGAIN…and thereafter maybe resume the bull move and see a strong finish to the year…Obviously, however, any time you start saying (as I just did), “The market will do this…and then it will do that…an then it will do this again”, you are just begging to be wrong, so the main thrust here is simply: Buy Stocks Now. Be in now. DON’T wait until all the TV guys start getting excited. As “surprising” as this strength in stocks and the economy will be (both in the USA and the rest of the world), I think the trading world will be even more surprised by what happens in a number of other markets…which I will address in Part 2 of this newsletter, hopefully to go out tomorrow (Monday) night. I’d love to hear what YOUR opinion is regarding what I’ve written here. So definitely give me a call if you have anything you’d like to add…or disagree with here? And the answer is yes, ABSOLUTELY. One day or one event does not make a market and today’s volatility is one of the reasons I chose not to recommend buying the stock indices until they were making new highs (going WITH it)…This is not to say that if Stocks get hit hard enough here I wouldn’t be interested in buying into the weakness, but for the time being I will sit tight on the idea of buying as the market is getting STRONGER. I would also point out that even though the headlines make it sound like the sky is falling in China, and in equity markets around the world, on the charts, today’s action just DOES NOT appear to be significant. And here’s is the Dow with Monday’s action..
WILL BE PROVEN DEAD WRONG. 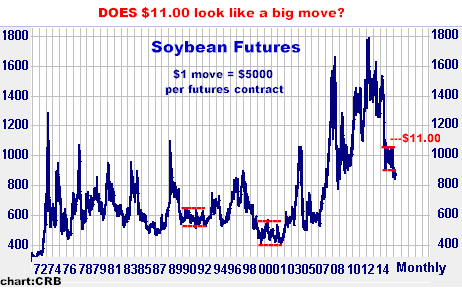 One of my primary beliefs about futures is that they are inherently volatile…They MOVE…and they frequently move BIG…and my basic approach to trading is therefore to position for major percentage trends in bull or bear markets. 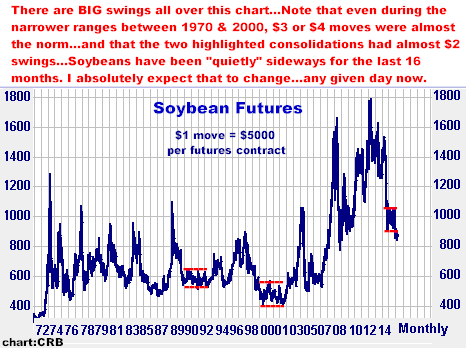 For the bulk of 2015, I was positioned in 6 major trades…Cattle, Corn, Cotton, Soybeans, Wheat and the Eurocurrency…and 5 of them essentially went nowhere…which was HIGHLY unusual from a historical standpoint…and I therefore believe the odds have skyrocketed that ALL of those markets WILL make very large, one directional, SUSTAINED moves in 2016…and similar to the stock market, I think they could all initiate those trends right out of the gate here in January. No, they don’t have start on day 1 of the year, but I do think you will be looking back six months from now and noting that all of them DID have their significant low…some time about NOW….and by mid-year had all begun strong large percentage moves to the upside…And they will have done so in the face of the massive sentiment that, “The world economy is weak. 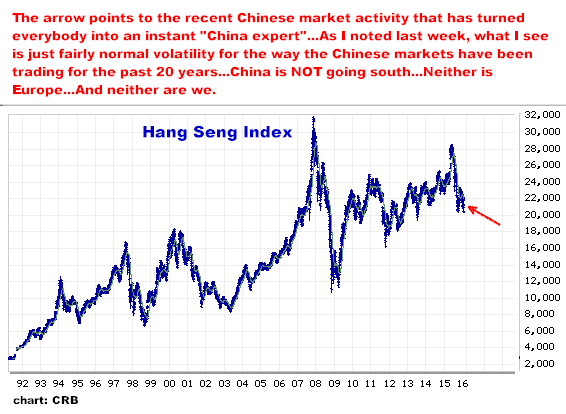 China is weak…and commodities are a sell!”, which I firmly, firmly consider to be totally backwards. 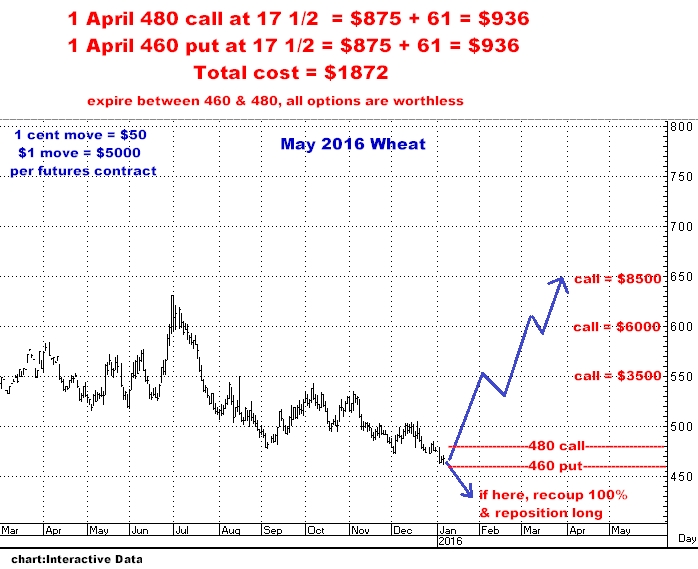 The chart following adds the prices of Corn, Wheat & Soybean futures together to present a cumulative value of these three major interrelated US crops...As can be seen, these crops traded in a price range for about 35 years (between $10 & $17), and as the costs of production are now certainly higher than they were 40 years ago, I suspect that this $17 level may now be something of a lower boundary for crop prices going forward. 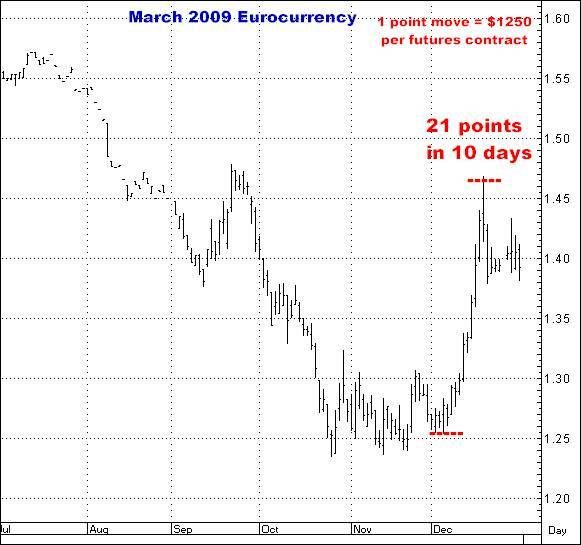 Never forget that big price movements ARE dictated by players getting in and out (buying and selling), and when you DO get a ton of money overloaded on one side of a market…when you DO get everybody as short as they possibly can be…It DOES frequently produce sharp market reversals when all those funds who have so heavily SOLD, suddenly find themselves forced into equally heavy (and fairly immediate) BUYING. I literally have seen it happen too many times to count. 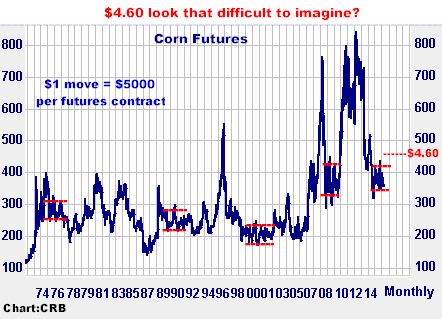 I repeat: FUTURES ARE INHERENTLY VOLATILE. Large sideways moves ARE often followed by BIG one directional trends…and believe me, virtually ALL of them get started when EVERYBODY in the analytic community is loaded on one side of the markets. 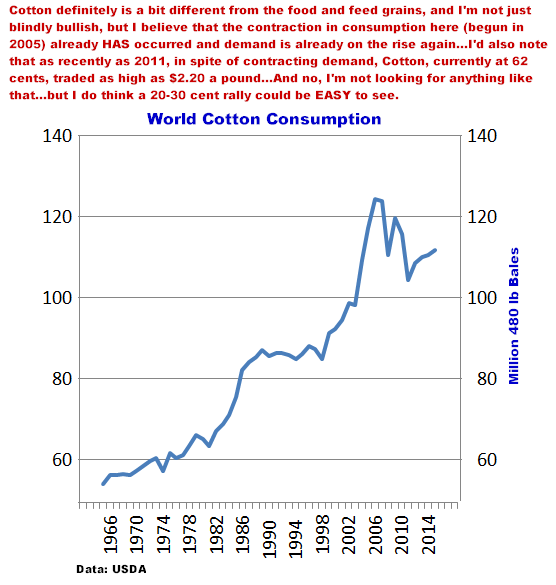 Generally speaking, DEMAND NEVER STOPS RISING…but Supply, which HAS to keep increasing to meet that demand, DOES contract at times (usually due to low prices), DOES experience weather events, and DOES occasionally fall short of what is needed for world consumption…which, simplified, is when you get NUMEROUS surges in prices on ALL of the longer term charts shown above…and especially when prices are already BELOW THE COST OF PRODUCTION, which is essentially the situation we now have here in the United States. 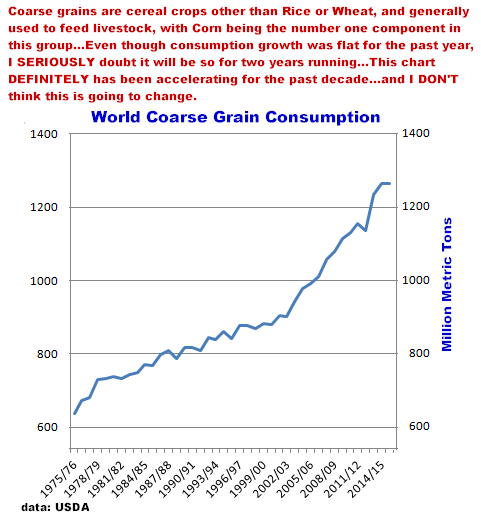 See what you think…Here are some world demand charts which should CLEARLY demonstrate that record crops, in all these commodities, are almost a necessity…and that ANY “abundance of supplies” can disappear in the blink of a single weather event…or contraction in acreage due to unfavorable prices. 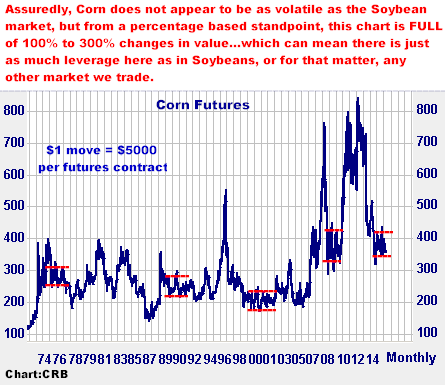 As previously noted, I was on all four of these markets for the greater part of 2015, and while Corn, Wheat and Soybeans rallied briefly last summer, the end result is they all finished 2015 sideways to lower…which was frustrating for me as sideways is the worst thing that can happen if you are an options buyer…which I am…But, sometimes you have to discard what HAS happened in this business and force yourself to objectively, without fear of losing, assess the possibilities you see in the markets without thinking, “What if I am still wrong?”. 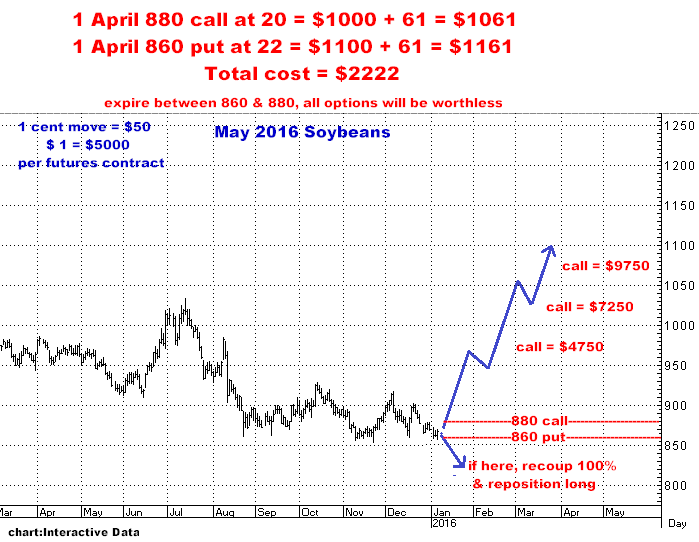 When the setup is there, and the percentages as well, you HAVE to take the trade. Part of this business is being right and wrong, and just because what you recognized as an incredible situation does not work out once…does NOT mean it won’t work the next time. And I am absolutely certain this IS the case with all of the markets I am currently recommending. 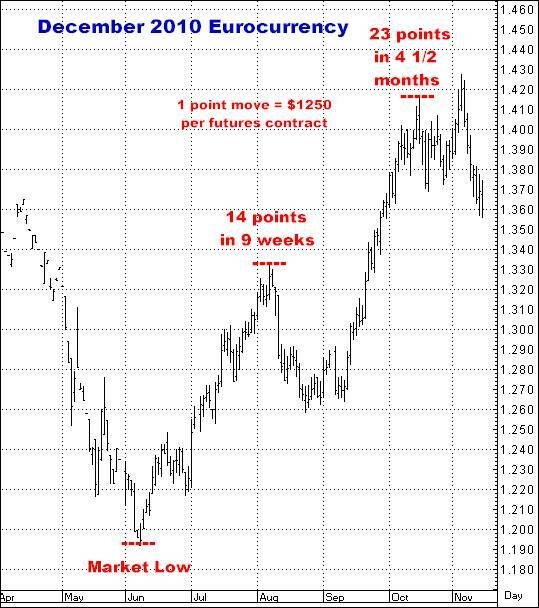 Futures ARE inherently volatile and I cannot imagine that 2015’s sideways markets will be the same in 2016. So, what is really important here are the numbers…how these 1 & 1’s do set up…and what are the possibilities for how the both sides strategy will work out…whether the market continues lower…or sideways…or higher…It’s all about what each position costs and how the numbers work from there…And NOT just because the purpose of this newsletter is to convince you to buy my ideas, but I DO think these are all fantastic set ups…I DO think there is NO WAY these four markets are just going to meander nowhere…And maybe I am dead, dead wrong, but I DO think there is incredible upside potential here, ESPECIALLY if you position in all four markets...as…for starters, I never know which one will necessarily go first, or biggest…and secondly, because the math says that if just one of them goes, and the other three totally, totally flatline sideways, and become worth ZERO, that one winner will quite potentially still have you coming out ahead…And while I certainly may be just blindly, stupidly optimistic, I think the odds of “flatline” are virtually NIL. I THINK THIS IS A KILLER “PORTFOLIO”. To do all four 1 & 1’s would cost $7863. I think the odds of these 4 markets just laying here are quite low. 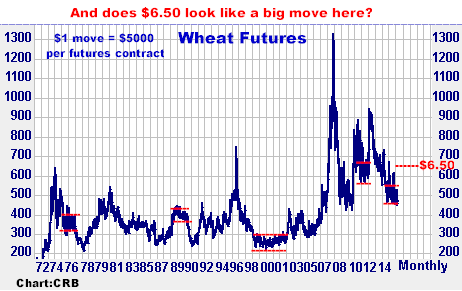 I think the price objectives I have noted in each commodity are all quite realistic…moderate even for the size moves all of these markets can make. If any of these markets continue lower, I see the distance they need to travel to recoup 100% as quite small…And we WOULD then reposition long at much better (lower) price levels. 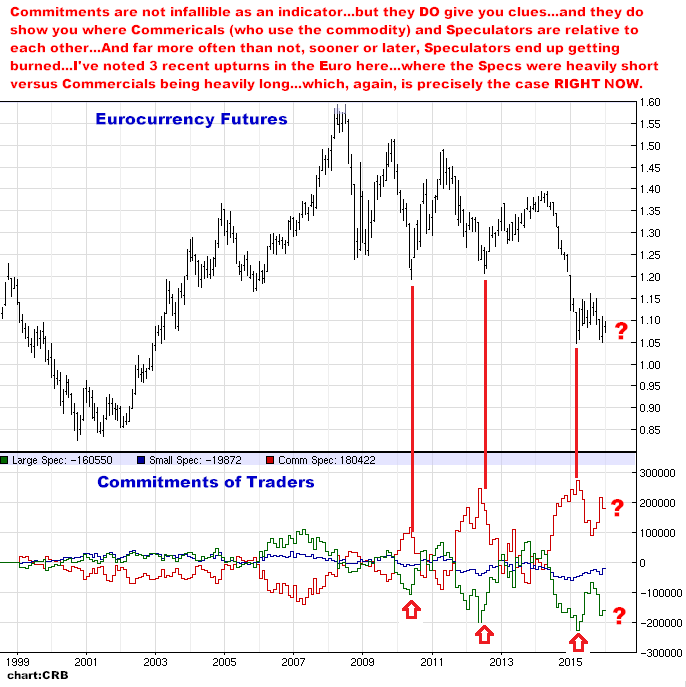 I reiterate: To do all four makes tremendous sense and absolutely increases the odds, I believe, of either scoring big…or not losing…I am, however, compelled to point out that it is certainly possible all of these markets will go nowhere…and if this is the case, you could lose everything you invest. THEY ARE ALL IN THE HOLE. 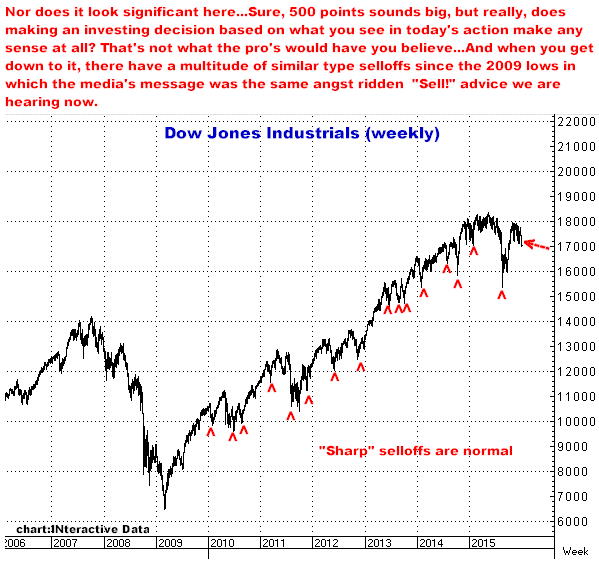 THE “FUNDAMENTALS” ARE SUPPOSEDLY OVERWHELMINGLY BEARISH IN ALL OF THEM. 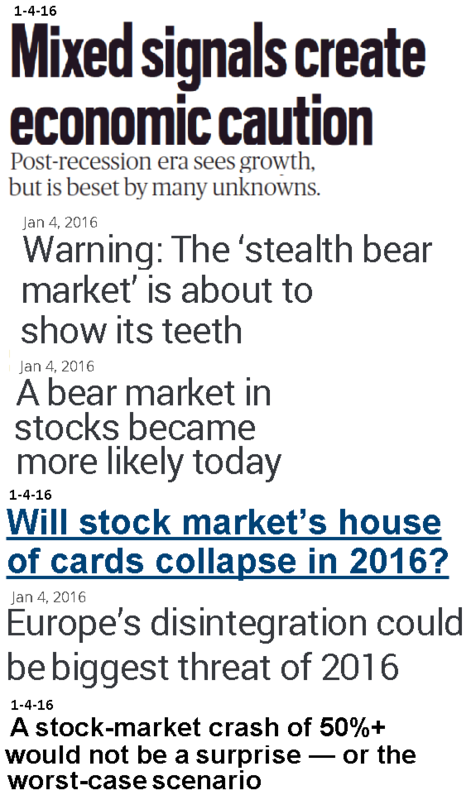 BROKERAGE ANALYSTS APPEAR TO BE UNANIMOUSLY BEARISH. THEY HAVE ALL BEEN SIDEWAYS TO SLIGHTLY LOWER FOR OVER A YEAR. 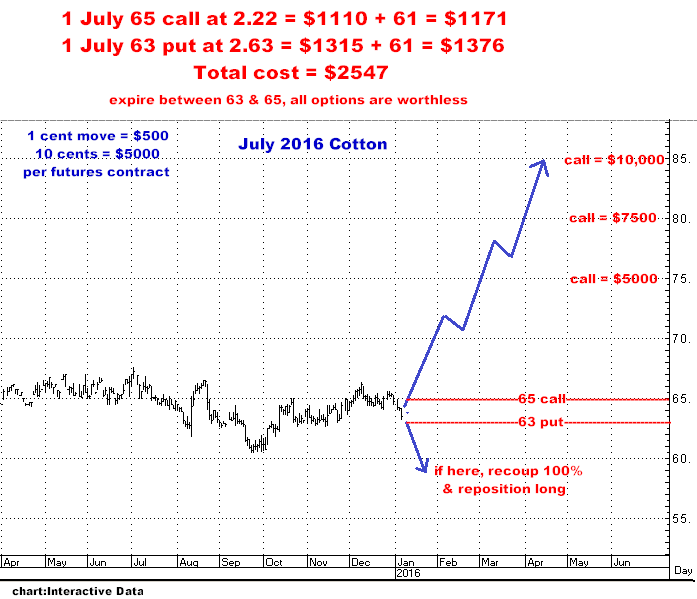 OPTION PRICES ARE VERY ATTRACTIVE. 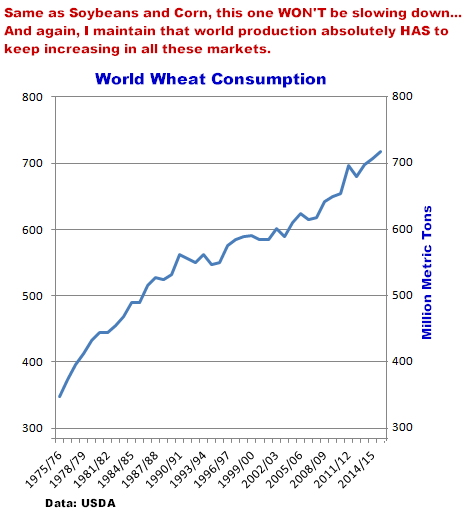 WORLD DEMAND CONTINUES TO SURGE. I THINK THERE IS NO WAY THEY CONTINUE SIDEWAYS. I THINK THERE IN NO WAY THAT IF THEY GO DOWN, THEY WILL STAY DOWN. I REALLY THINK THERE IS NO WAY THEY ARE GOING LOWER. ABNORMAL WEATHER IS HAPPENING ALL OVER THE WORLD. 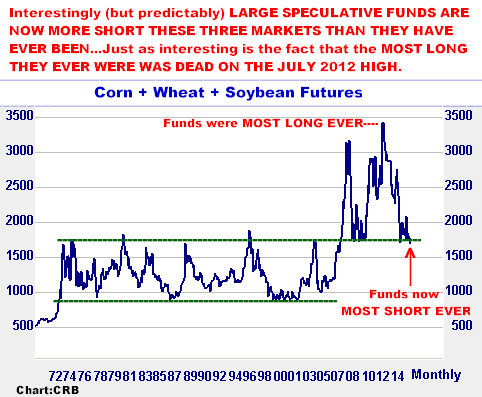 THE FUNDS (AND ALL THE MARKET MOVING MONEY THEY REPRESENT) ARE MORE SHORT THAN THEY HAVE EVER BEEN. If you want to believe all the LATEST claptrap about the world economy slowing down, or being in crisis mode, and assume that all these markets are going to just lay here dead in the water, go ahead. But I say that demand growth is unceasing in all of them, and there isn’t a historical commodity price chart in this newsletter that doesn’t go down AND up…And simply stated, one of the reasons I want to own all of these markets is because I know I am buying them when the analytical community is generally negative about everything…the world economy, stocks AND commodities…And having witnessed 100’s of supposed crises during the past 35 years, I have yet to see a single one that could permanently derail either the markets or the world economy. This game is a series of phases and I think the next, and imminent, phase in commodities is absolutely on the upside…And I totally, absolutely and unconditionally believe you should be buying all of these markets NOW…I say none of them are going sideways, and as ever, if they DO crack lower, the 1 & 1 should allow us to recoup our investment in any/every one of them and then reposition at even better levels. I AM LONG AND STAYING LONG...IN ALL OF THESE MARKETS. This is enough for one day…I still have a few more markets to address but they will have to wait until tomorrow in what I guess will be 2016 Outlook – Part 3. 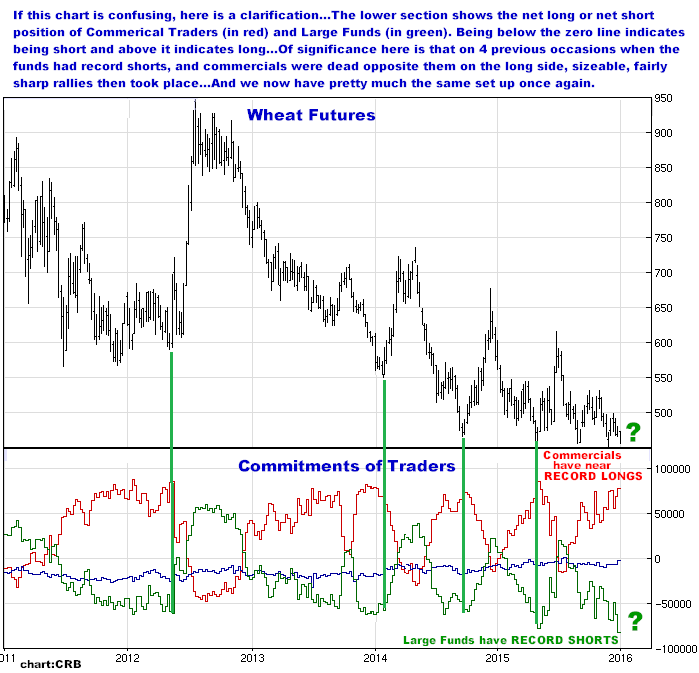 Above and beyond anything I “know” about any of the individual commodity futures markets, my overwhelming experience has repeatedly been that those trades which are the hardest to make (and consequently VERY few people take them) are usually the best ones that ever come along. 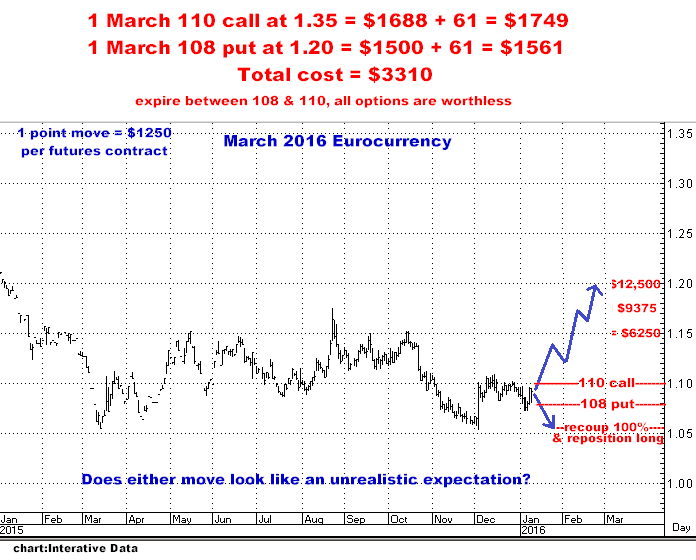 Six months from now I believe we will be looking back at the unanimous “strong dollar” opinion, and be realizing, again, how much obvious sense it would have made to be betting in the opposite direction…in other words, Shorting the Dollar and Buying the Eurocurrency. OK…Those very specific observations were made by the guy who was at the top of the economic information chain, and if this man is telling you that nobody ever knows where the currencies are headed, you’d better believe it…In other words, when, ESPECIALLY, you’ve got a whole herd of internet painted faces giving you the same stale (as in year old) reasons why the Dollar is going to “stay strong”, you really need to be positioning for exactly the opposite. The Dollar and the Euro are just pieces of paper and their values are always changing based on mob psychology (and monster cash flows chasing popular ideas at the click of a mouse) more than anything else. And going all the way back some 30 odd years to when I was with Merrill Lynch, I can tell you that fully 100% of the time, Merrill’s supposedly super-knowledgeable, well coiffed and incredibly articulate analysts (often “international experts” from London whose accents made them sound extra intelligent), were essentially CLUELESS. For sure, they always sounded smart. Everything they said made sense…but in the final analysis (which way the market actually went), they were always wrong…And, believe me, I remember all this quite clearly…as I was then young, inexperienced and initially bought in to their seemingly flawless “logic”….and got CREAMED. 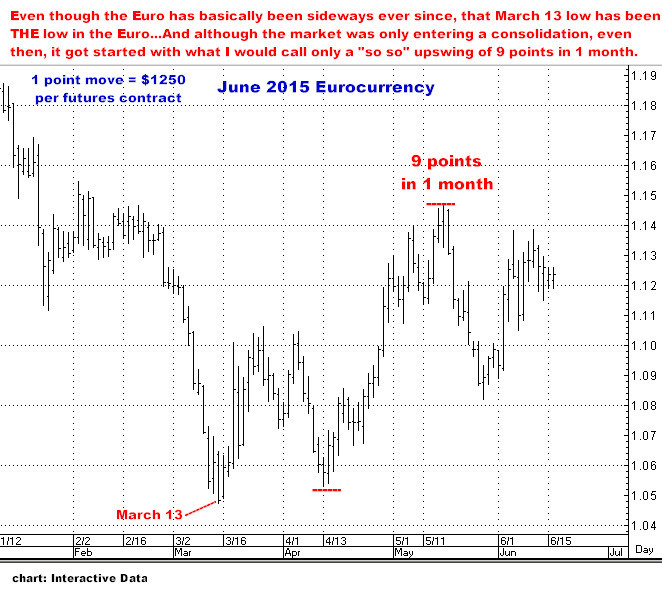 I WILL SAY IT ONE MORE TIME…THE MOST POPULAR AND FAIRLY UNANIMOUS OPINION IN THE MARKETS TODAY IS “THE STRONG DOLLAR”, AND I AM 150% CONVINCED THAT LONG THE EURO (BASICALLY THE SAME AS SHORT THE DOLLAR) MAY BE ONE OF THE BIGGEST TRADES OF 2016. You can dismiss all this if you want and go with the crowd…but if you do, I’d say you are making the same mistake that the masses made in just the last few years…that is, believing all the analysts…at $1900 Gold or $110 Crude (just to mention a few recent examples). 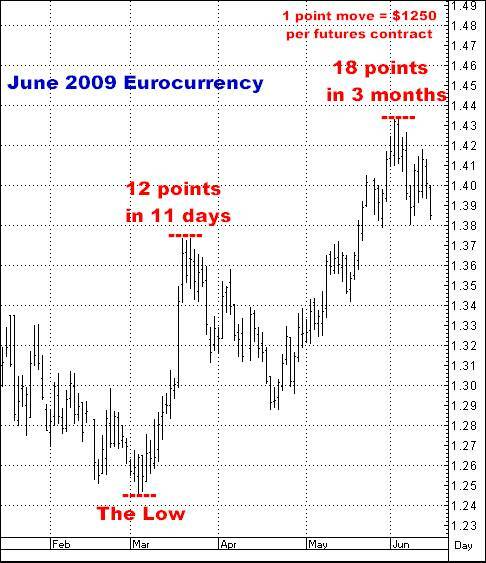 Do observe that prior to the recent bull move, the Dollar had been dead sideways for almost 3 years…from September, 2011 until July, 2014…when the most recent actual move in the currency…UP…started in earnest. And then note that the move ENDED in March, 2015...or almost exactly 8 months later…and fully 10 months ago. 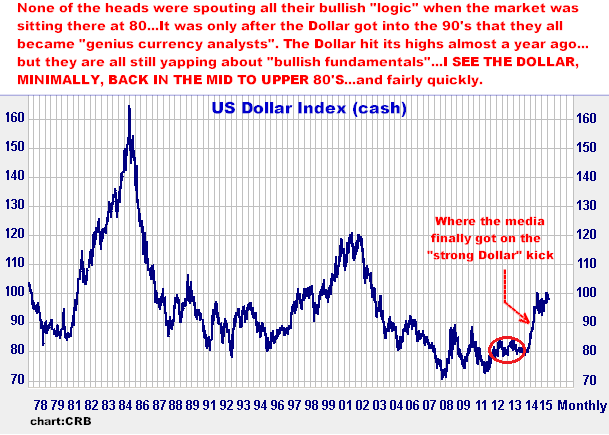 TO BE PERFECTLY CLEAR…THE “STRONG DOLLAR” HAS BEEN NOTHING MORE THAN AN 8 MONTH BULL MOVE. 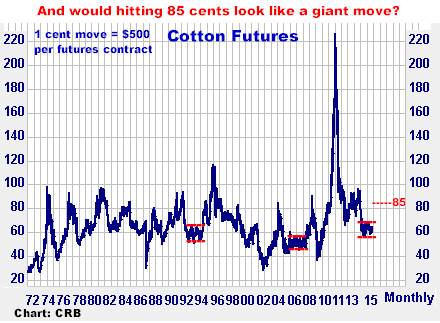 To begin with, I will repeat that virtually NONE of the yakheads were referring to the "Strong Dollar" when the index was sitting there at 80 in July, 2014, and none of them were even close to expecting a bull move...They WEREN'T…In fact, per Commitments of Traders and futures open interest from that 8 month period, one can easily determine that it was only when the index was approaching the 90 level in December, 2014 (10 points and 5 months after the 8 month began) that the internet TV boys started getting excited and spouting all their bullish "logic" regarding the Dollar...and this is also when specs finally started piling in on the long side…And plainly stated, they became typically more certain of their opinion and progressively tremendously more aggressive buyers as the index made its last few months run up to the 100 mark…which can be seen in the fact that during that period, total futures contracts jumped by over 60% (90,000 to 150,000)...In other words, they (and all the painted faces) ultimately became “rabidly” bullish at the very top. 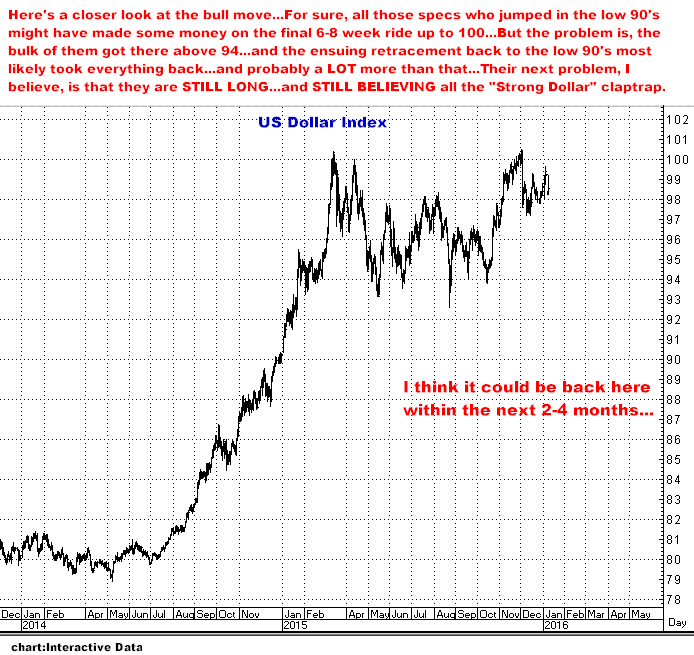 To reiterate, THE DOLLAR REACHED ITS HIGHS ALMOST A YEAR AGO…Since then, “The Strong Dollar” has been like one of those market mantras that everybody keeps repeating…NOT because they have an understanding of what does move the markets, but simply because they’ve heard it from a 1000 other airheads…who are also just regurgitating an opinion they’ve heard from everybody else. Here are a couple of ways to take this position in today’s market…And, as always, I ABSOLUTELY RECOMMEND USING THE 1 & 1 APPROACH…as it DOES allow us to reposition at lower levels if the market gets pushed lower…and it DOES give us PLENTY of leverage on the upside. 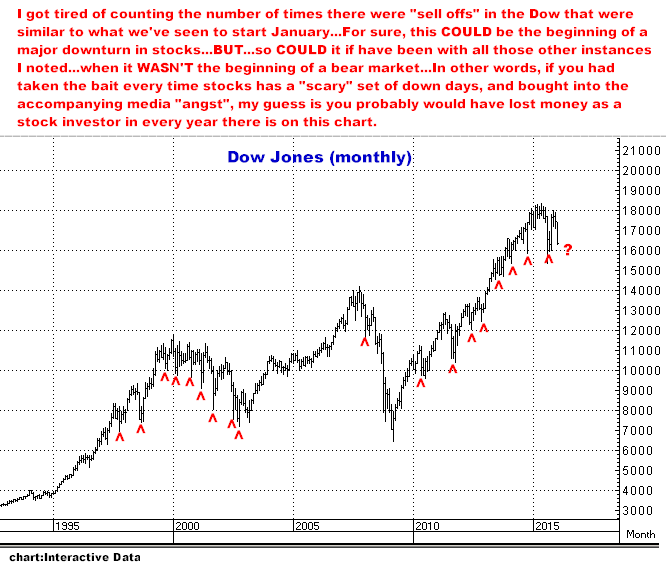 So last week was “the worst first week to start a year EVER!”?…In my opening Outlook for 2016 pieces, I stated that I was bullish stocks but recommended buying stock indices if the Dow could take out its December highs…or…that if there was a sizeable setback I would consider buying that weakness…With the Dow having dropped 1000 points last week, I AM NOW BUYING CALLS IN THE MINI-DOW, MINI-S&P AND MINI-NASDAQ…In fact, I started doing so into Friday’s dead low close…Yes, it was a big down week, but in the long term context of what that week looks like on a chart…as I have noted before…the action was not unlike what we have seen over and over on the way up since 2009…And I will also repeat that this is also the case with the China markets…What has been happening there is also “par” for the course of the way their markets trade. 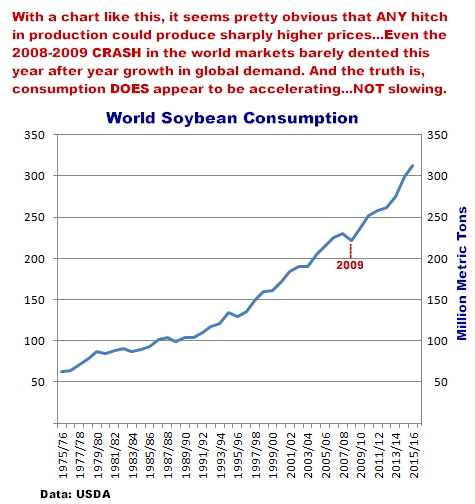 I also continue to maintain that the world IS on a gigantic economic upswing due to a long list of factors I have cited in previous newsletters…This is NOT 2001. This is NOT 2008…Cheap money, cheap energy, the Technology Revolution and exploding worldwide capitalism/consumption are all FACTUAL REALITIES…To me, the bet for the future is absolutely on the upside…and I recommend that you DON’T allow yourself to be swayed by the perennially ongoing talking head negativity…and their current freaky shouts that China’s stock market and sliding Oil prices are signals that we are all headed down the drain…They are wrong. Over and out…Call me if you are interested in any of these ideas…or if you just want to say hello…or disagree with me. Crude Oil is done on the downside. I say it WON’T see $30. 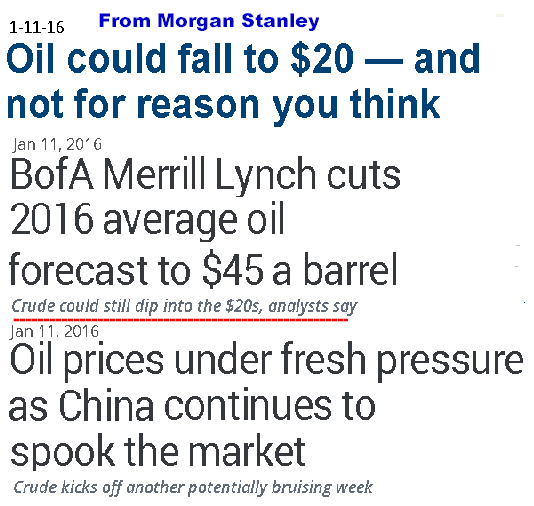 18 months ago (July, 2014)Crude Oil was at $108 a barrel and the ENTIRE brokerage house world was NOTHING BUT BULLISH, to the extent those guys could not even imagine ever being back below $100…Now we are just above $30 and all those same geniuses are predicting, with almost the same stupid certainty, as they cite what are now, “bearish fundamentals”, that Crude is headed for $20…AND ONCE AGAIN, I THINK THEIR TIMING AND OPINION COULD NOT BE ANY WORSE. 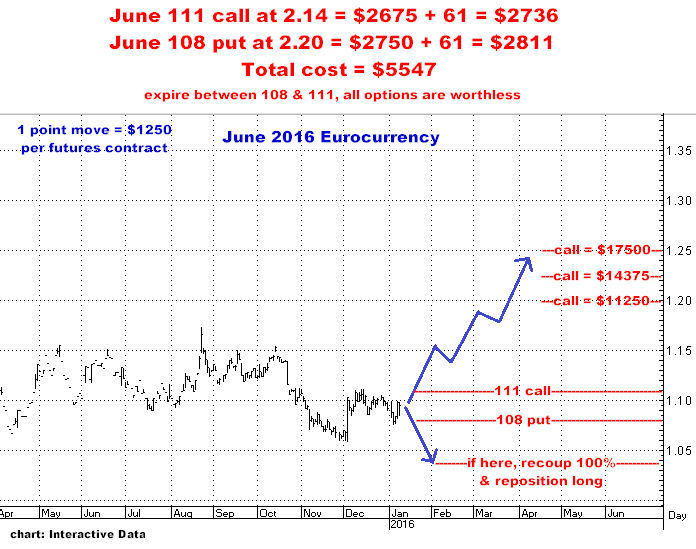 IN MY OPINION, THE MARKET IS A BUY HERE…NOT $10 LOWER…AND NOT $2 LOWER. January, 2014…my impression is that the prevailing media/brokerage house attitude seems to be, “Crude can’t fall below $90”, that there is too much demand for it to do so…But for my part, I can’t help but believe the WORLDWIDE developments in fracking MUST be changing the supply-demand equation to some extent, and where 5 years ago all the “peak oil” production nonsense was able to drive prices up from $30 to$150, it therefore now seems quite plausible that even $90 Crude Oil is vastly overpriced…And if so, why couldn’t we be headed back to $60 or $70 a barrel? 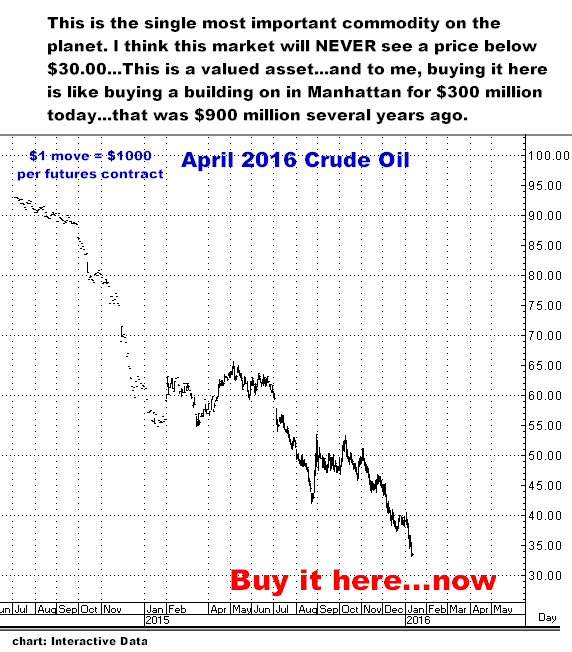 Do understand, I’m not trying to make a big statement about oil prices going south for years…just that, RIGHT NOW, I think a bet on the short side is a great one…And when I look at the price chart above, I DO think, “It was at $70 in 2010. Why couldn’t it go there again?”. 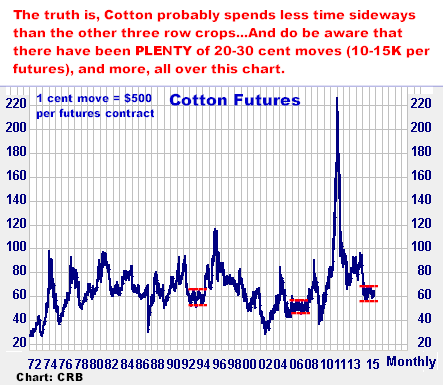 I may be dead, dead wrong…but again, I say this market is now an outrageous buy. 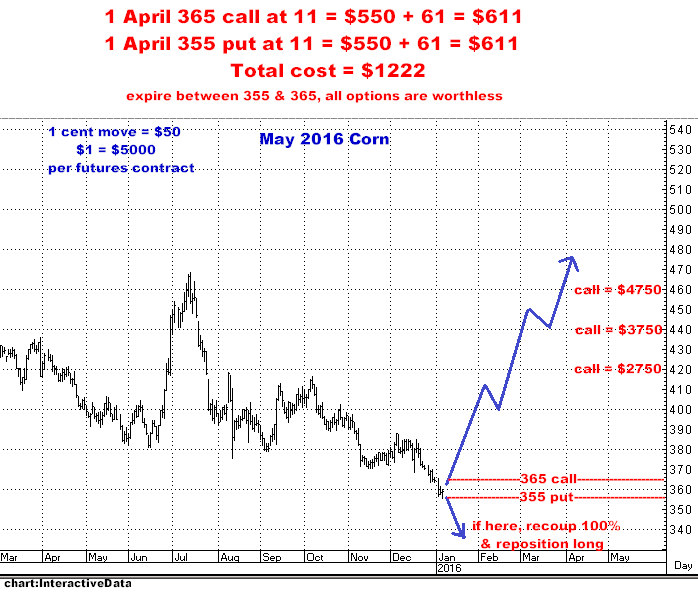 There are a number ways to do this…With Options, with Futures or Mini-Futures…If you want some numbers, or ideas about how to do this, pick up the phone and call me.